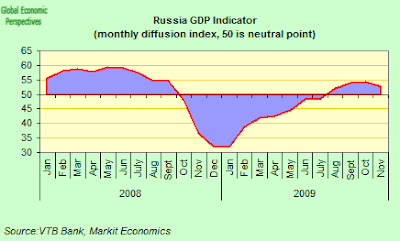 As doubts grow that in the post Dubai world Russia's central bank will be able to sustain a great deal of momentum in its ongoing programme of interest rate reductions, we learn this week that the pace of expansion in Russia's economy slowed back in November, following two months of steady advance in September and October. This time services activity also weakened its advance while manufacturing activity registered its second month of contraction. Yet the central bank may well show increasing restraint in lowering interest rates, even as the economy slows, the ruble rises, and bank retail lending continues to fall, having declined for nine consecutive months up to and including October, while corporate lending dropped for a second month in a row and hasn’t risen for six months (for more on the particular topic see my recent post - Are Russia's Consumers Getting "Carried Away" With Themselves?). While the seasonally adjusted VTB Capital Total Activity Index remained in positive territory for the fourth month running in November, the latest figure of 52.8 indicated the weakest rate of growth in three months. 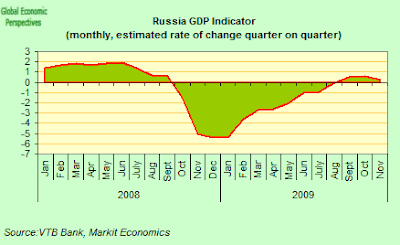 The VTB Capital Monthly GDP Indicator, based on the PMI surveys for both the manufacturing and service sectors, continued to show an annual economic contraction in November, even if the the rate of decline eased for yet another month. At an annual minus 2.5%, down from a revised minus 4.0% in October, the indicator stood at its highest level since December 2008. Over the third quarter as a whole, the GDP Indicator suggested that the economy contracted by a revised 8.7% year-on-year, a better outcome than the record 9.9% fall posted during Q2. Data for the first two months of the final quarter show an average contraction of 3.3%. By contrast the quarter-on-quarter rate slipped back to a bare 0.2%, treacherously close to the dividing line between contraction and expansion. The outcome is not surprising when we take into account that November saw an overall deterioration in business conditions in Russian manufacturing for the second month running. Output rose only marginally, while incoming new orders fell for the first time since June. Growth of purchasing activity was maintained, but at a slow pace, while employment continued to fall. 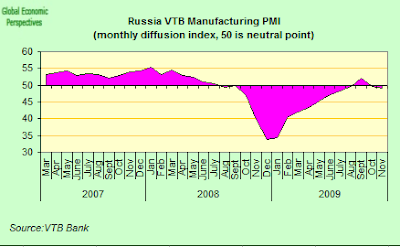 Thus the headline seasonally-adjusted Russian Manufacturing PMI remained below the no-change mark of 50.0 for the second month running, and although the November figure of 49.1 indicated only a marginal rate of deterioration, it was still slightly worse one than the 49.6 posted in October. The fall in the PMI primarily reflected slower output growth and falling new orders. 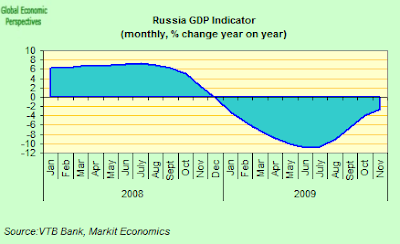 Business conditions in the Russian service sector, on the other hand, continued to improve during the month, albeit at a weaker pace than previously. The easing primarily reflected slower rates of growth in business activity and new business, which both remained well below pre-crisis levels. Meanwhile, inflationary pressures remained subdued, with input prices rising at a relatively weak rate and charges falling slightly for the second month running. 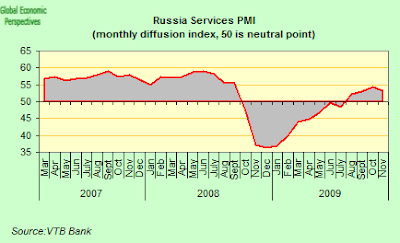 The headline seasonally adjusted Russian Services PMI came in at 53.3, down on the 54.3 registered in October, and well below the historic average of 56.9, highlighting the fragility of the Russian recovery. Restricted credit continued to be a theme in this months survey responses, although sector data pointed to a stronger rise in financial intermediation activity. The rate at which incoming new business increased slowed during the month and contributed to additional spare capacity at service providers and a faster decline in outstanding business. Backlogs of work have contracted every month since September 2008, and the latest rate of decline was at the most rapid rate since July. Some aspects of this recovery globalwise just don't make sense to me. 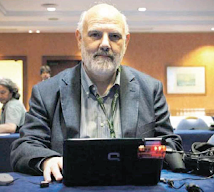 The insane money printing, demographically collapsing nations burying themselves under mountains of debt, the continuing trade and exchange rate imbalance between China and the USA, export led recoveries in Asia and elsewhere exporting to God knows where. Something just does not make sense here, does it? You don't see any spam becuase the comments are moderated. You have no idea how much junk comes in all the time. That's why Facebook is a better place for comments. On the other hand Russian equities are rising so there must be an alternative analysis. I think that one would also have to observe that Russia still has an oversized manufacturing sector in so far as much of it is still post soviet and heavily protected. Removing this drain on resources would allow the better quality enterprises, which do exist, to be seen. The comments on my own site are hugely out of date. I have no time to update. I agree that Russia is not ooming any more. The Moscow city tower is to become a car park. What is Russia to do to reduce dependence on commodities? The oil industry was taxed to a standstill in 2004. After a bit of thought, I think I vote for a higher rouble. Real wages will go up in the short term but Russian private sector labour markets are flexible. The reserve of unemployed will keep wages down for new hires, particularly for incoming investors who will have to do some training anyway. Meanwhile, the higher rouble reduces retail inflation, somewhat so there is breathing space for a few months. Do yourself a favor and google up the Russian age pyramid for the next 5 years. And keep in mind that even according to the Gostat's doc sourced by SO, the ideal family size among Russian teenagers (Russia's next generation) is sub replacement. You don't need to know more than this.